Manchester was painted blue on Sunday, as Manchester City were able to defeat Manchester United 3-1 at the Etihad. The Sky Blues continued their unbeaten run of games courtesy of an early strike from David Silva, before Sergio Aguero extended their lead to 2-0 early in the second half. Just as the Red Devils hoped to engineer another one of their comebacks powered by an Anthony Martial penalty, substitute İlkay Gündoğan secured City all three points with his goal, the final scoreline standing 3-1. The winner had a brilliant 44 passes building up to it, while Martial’s strike was a result of returning striker Romelu Lukaku being fouled leading to the spot-kick. Even though United lost out on the night, Martial notched a nice place for himself amongst the side’s history books. With his penalty kick, Martial has now scored for five consecutive games in the Premier League. The list of red shirts who have achieved this is quite slim, with the young Frenchman joining the ranks of Eric Cantona, Dwight Yorke, Cristiano Ronaldo, Wayne Rooney, and Robin van Persie. Not a bad company to keep for a player who is only 22 years of age. 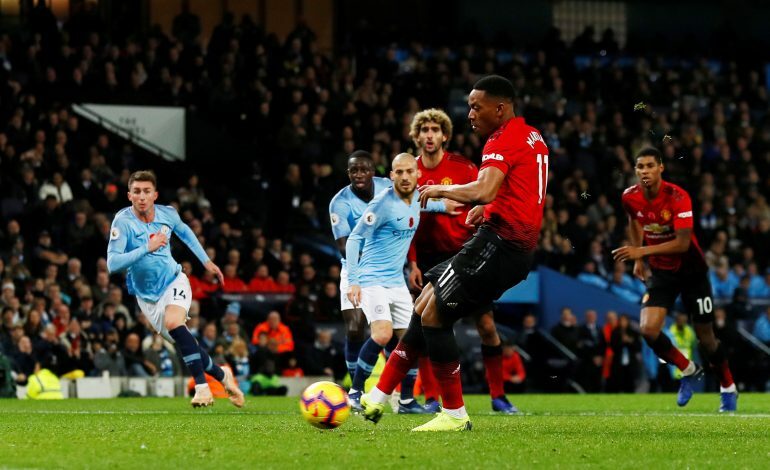 Martial has scored 6 times in his build-up for the side, each of those goals save the one on Sunday culminating in a brilliant comeback for the Red Devils, with Newcastle United, Chelsea, Everton and Bournemouth being the first sides to fare against the Mancunians. He is now only two goals shy of the top-scorers’ spot in the Premier League, tied on goals with several stars, while Aguero takes the pinnacle spot with his goal against United. The young starlet will certainly still hope that this form helps him retain the constant spot in Mourinho’s starting lineup, with the one fielded at the Etihad ensuring that Alexis Sanchez was left on the bench.